Built in the 19th century, the monastery building now boasts an extensive renovation with state-of-the-art infrastructure in a historic atmosphere and a guest house with an innovative energy concept opened in 2015. Equipped in this way, the Physikzentrum Bad Honnef has long been one of the world's most important conference venues in the field of physics. The programme consists primarily of scientific seminars lasting several days, which attract more than 5,000 young and established scientists from all over the world to the Rhine every year, including Nobel Prize winners in physics on a regular basis. You can rent the premises of the house for your physical event. 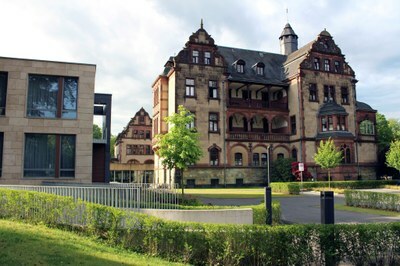 In addition to the various conference rooms, the Physics Center Bad Honnef offers an infrastructure for up to 100 guests. With a total of 99 beds, its own kitchen and service personnel, the Physikzentrum Bad Honnef offers many possibilities for your event. In the house there is free WLAN and a computer room with printers. The in-house kitchen takes care of the physical well-being during the events. In addition to the dining room on the ground floor, the Physikzentrum has a cosy wine and beer cellar in the basement, the Georg Christoph Lichtenberg-Keller. Here, after-sessions can take place in a cosy atmosphere. It is not uncommon to hear reports of conversations that lasted well into the night in the Lichtenberg cellar. "That's where science is made on the beer mat." In addition to the conference and meeting rooms, there are a total of 59 beds in 41 rooms in the historic monastery building. In addition to a three-bed room, there are 16 double rooms and 24 single rooms. It is also possible to obtain extra beds for children on request. The room facilities include towels, bed linen, a desk and a shower. The guesthouse is located directly next to the monastery building and consists of 40 modern single rooms. The rooms are also equipped with towels, bed linen, a desk and a shower. Guests staying overnight at the Physikzentrum Bad Honnef can use the underground car park under the guest house. The supporting programme of an event can be very varied due to the various possibilities of the direct surroundings. Hikes in the Siebengebirge, for example on the Drachenfels, are just as possible as a boat trip on the Rhine (from Königswinter). Also the good public transport connection to the two nearest bigger cities Bonn (approx. 35 minutes) and Cologne (approx. 45 minutes) opens many possibilities. In Bonn a visit to the Museumsmeile, the Deutsches Museum Bonn or the student laboratory of the University of Bonn is worthwhile. Bad Honnef also has some highlights to offer: Visit the Konrad Adenauer Wohnhaus in Rhöndorf or make a wine tasting with local winegrowers.